I jumped on this product when I heard that I could replace linguini noodles with zucchini, because as much as I love pasta, my body does not. Truthfully, most pastas are not particularly healthy for us in large quantities. This includes brown rice pasta, and even quinoa pasta which is usually combined with either starchy corn or rice flour. When the starch in the pasta breaks down, it turns to sugar. This sugar is metabolized through the liver where it turns into fatty acids that are released back into the blood stream, so that they can be transported to other areas of the body for storage. Yes, whole grain and alternative pastas are "healthier" than traditional wheat pasta in terms of nutritional content and stress on the digestive tract, but the starchy aspect is not-so-great for those looking to keep their weight down and blood sugar regulated. While I would never deter anyone from enjoying pasta (I love it too! ), I do advocate giving the body a rest once in awhile by cleaning things up with greater vegetable consumption. Especially during the festive season when we allow ourselves more indulgences than we normally would. This particular dish is very easy. 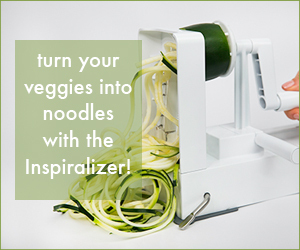 Run your veggies through the inspiralizer and roast them for about 15-20 minutes until al dente. For the gravy, no need to make a roux - just simmer a few vegetables in broth, purée until smooth and add your spices and salt. Then toss the peas and chicken with the noodles and drizzle on the gravy. The roasted noodles have a wonderful buttery flavor. The gravy is spicy with a bit of kick from the pepper. And the twirly noodles actually make eating vegetables fun! In a saucepan, combine the carrot, celery, onion and broth. Bring to a boil, then lower the heat and simmer until the vegetables are fork tender. Remove from heat and allow to cool. Pour into a blender and purée until smooth. Press the purée through a mesh sieve back into the saucepan. Stir in the seasoning, thyme, salt and pepper. Heat the gravy until it begins to bubble, lower the heat and allow to simmer until ready to use. Meanwhile, pre-heat the oven to 400ºF. Line a sheet pan with parchment paper or foil, then drizzle with oil. Spiralize the parsnips, carrots and onion into linguini size noodles. Place the noodles on the baking sheet, drizzle with a touch more oil and sprinkle with salt and pepper. Bake for 15-20 minutes, until al dente. Remove from oven and transfer the noodles onto the serving plates. Toss with the chicken and peas. Drizzle with gravy and sprinkle the parsley overtop. Serve immediately.